The movement for “free college”—at least at the two-year level—continues to build (see Sara Goldrick-Rab’s piece in this series). Hopes are high that free college would mean that more students, especially those from lower-income families, would attend and complete programs that help them get better jobs and improve social mobility. But will they? The short answer: these efforts may help a little, but much more than just free tuition is needed. Need-based financial aid boosts enrollment. It also helps more students to finish their degrees faster. What’s more, the promise of free college yields bigger benefits for lower-income students and traditionally underserved ethnic minorities. Many of the studies so far have focused on 4-year colleges and bachelor’s degrees, but evidence suggests that reducing the price at community colleges can also lead to more students obtaining college credit, associate’s degrees, and, ultimately, bachelor’s degrees, too. Many of these effects seem to rely on the simplicity of signing up for, and getting, financial aid. The barriers to completion extend far beyond a lack of money to pay for college. In addition to poor academic preparation of students, scholars point to insufficient resources at the college level—students cannot always get into required classes and they forget certain deadlines when they have no one to help them. Poorer students are also disproportionately affected by family and other obligations. Indeed, these issues often become more salient when the initial hurdle of money for tuition is lowered, and students who otherwise may never have even applied enroll in college. Additional services to help students are likely to be necessary to bolster the impact of additional financial aid or “free college.” Thanks to a $3.2 million federal grant, the new Broncos First program at Western Michigan University, where roughly one-third of Kalamazoo Promise students enroll, now aims to provide services found to be effective in promoting college success for low-income and first-generation students, including mentoring and learning communities. 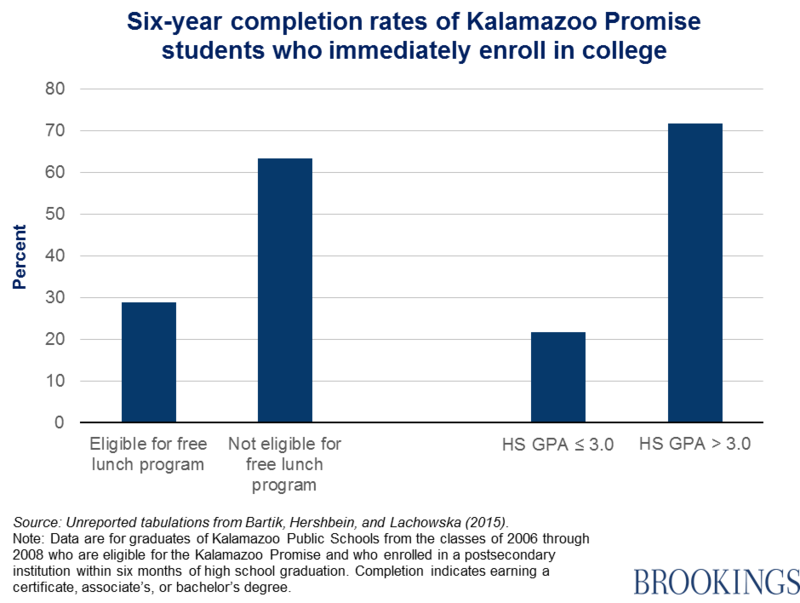 Because some students in this program will qualify for the Kalamazoo Promise scholarship and others will not, researchers will be able to determine how much Promise money can do to boost college completion, how much the support services can do, and—crucially—how much both can do together. Next up: Stuart Butler on rethinking college.